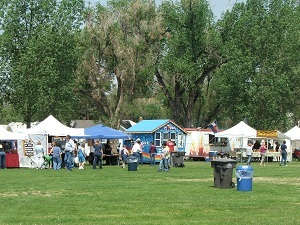 Summerfest on the Rio is held at Cole Park in Alamosa every year the first weekend of June. 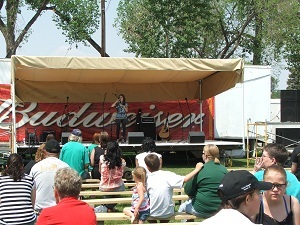 This year I (Debbie) enjoyed an opportunity to take in the many activities associated with the 9th annual Summerfest on the Rio held on June 3, 4, and 5 (2011) in Alamosa. 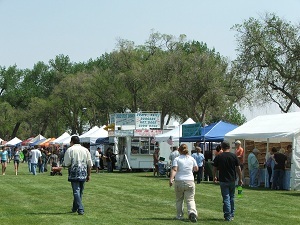 This is a fun activity where Cole Park is filled with over 100 booths serving food, selling crafts, activities for the children and live music. The 2011 music included Martini Shot, Sage Larsen, Bits ‘n Pieces, Blue Sky, The Rifters, Mo Jones Belly Satvva and the Ethno Rhythmics, 2 Weeks in Fuji, Pedro and the Pistons, Semillas de la Tierra, Waverly Band, Jeff Valdez, Sneakers and Indian Nickel. I was able to listen to Sage Larsen sing and what a wonderful country and western singer she is. The food booths offered a wide variety including fajitas, turkey legs, huge corn dogs, funnel cakes, fresh squeezed lemonade, cotton candy, kettlekorn, natural lamb kabobs, and many other food items. I enjoyed a turkey leg since it reminded me of times spent at the Colorado State Fair. The craft booths had everything imaginable! There was wood art, personalized gifts, clothing, jewelry and bead work. A unique booth was by the Blue Star Mothers. They had pictures of men and women from the San Luis Valley who are serving in the armed forces. What a wonderful tribute to our armed forces. I didn’t buy anything at the booths, but enjoyed looking at the many, many different crafts available. 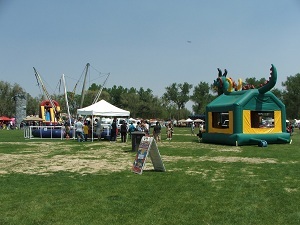 There were several activities for the children such as face painting, pencil drawings, caricatures, bounce house, bungee jumping, and the house of mystery. There were many children enjoying the day with their faces painted as animals. The Alamosa Police Department was riding ATVs and stopping with spray sunscreen to make sure the kids had enough sunscreen on to protect them from the intense sun. What a great idea by the Alamosa Police Department! Even with so many people there was a small town feel about the event, which is one of the reasons why I love living in the San Luis Valley. I encourage you to attend the 10th annual Summerfest on the Rio next year on the first weekend of June. I know you will have a wonderful time enjoying the live music, wonderful food, and looking through all the craft booths.